Ajwain, also known as carom seeds have many health benefits that can cure many illnesses in babies and toddlers. Ajwain is a very famous Indian spice that has been used for centuries to get relief from indigestion, constipation, colic conditions, cold and cough in babies, children and even adults. Ajwain also has immense medicinal value and babies get cured with the use of this magical spice. Whether ajwain is used in the form of seeds or mixed in water, the medicinal properties in ajwain make this spice a ‘go-to’ home remedy. 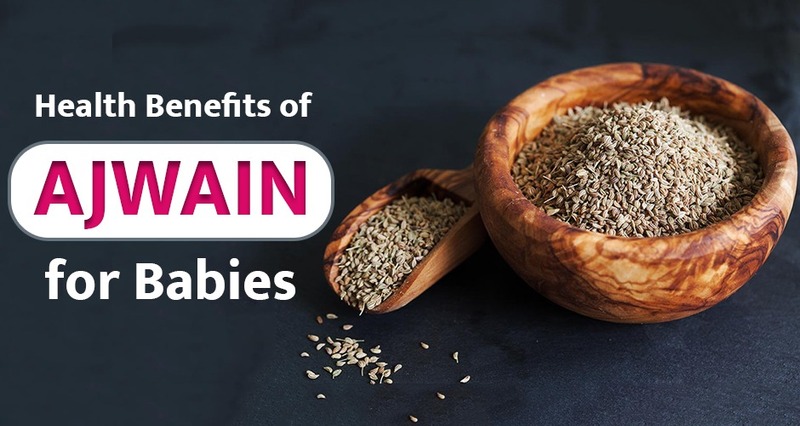 Let’s check out the health benefits of ajwain for babies. Ajwain is like magical seeds which are power packed with nutrients. The benefits of ajwain for babies are innumerable. It is also used as an antiseptic and contains various nutrients such as fibre, fat, protein, sugar, minerals, calories and antioxidants. It also contains various essential oils like terpinene, thymol, pinene, cymene and limonene which are soothing to the digestive system. What are the various health benefits of ajwain for babies? A change in weather brings about common cold and minor respiratory problems in small kids making it difficult for them to breathe. Ajwain is very beneficial for getting rid of phlegm. Boil 1 teaspoon ajwain, 8 to 10 Tulsi leaves, 1/2 teaspoon ginger (grated, optional), 5 black peppers, 1 clove, 1/2 teaspoon turmeric in 1/2 cup water for 10 minutes. Strain the liquid and let it cool. Add 1-2 tablespoons of honey or jaggery and give this herbal drink to your child. Boil 2 teaspoons of roasted ajwain in 1 cup of water until the water changes its colour to brown. Mix with sugar or honey before giving it to your child. Roast 2 tablespoons of ajwain on a tawa for a few minutes until the smell goes away. Transfer the roasted ajwain to a clean muslin cloth and make a potli or a tight pouch. Apply this potli on your child’s chest like a hot pad. Make sure it is not very hot. The ajwain potli helps to counter congestion in the chest and relieves a stuffy nose. 1 teaspoon of ajwain along with buttermilk works as good as as medicine that helps in getting rid of phlegm and promotes healthy breathing. Giving steam of boiled ajwain seeds also helps in curing common cold. Oil infused with ajwain and then massaging this on the baby’s chest and back is a wonderful remedy to fight that severe cough and cold your little one is experiencing. How to prepare ajwain oil? Mix a pinch of ajwain with a tablespoon full of mustard oil or olive oil and heat this mixture for some seconds. You could also add a couple of garlic pods to this for better results. Once the oil returns to lukewarm temperature, apply this onto your little one’s back as well as chest with a gentle massage. Make sure the oil is not very hot as it can burn your little one’s skin. Little babies are prone to digestive disorders and stomach upsets. They tend to put their dirty hands and other things in their mouths which leads to infections. When babies try new foods for the first time it can be a little hard on their little stomachs. So babies will feel better after drinking ajwain water. Giving ajwain water to babies suffering from constipation can cure this problem and even regulate bowel movements. How to prepare Ajwain water? Heat ½ cup of water in a pan. When it starts to boil, add ¼ tsp of ajwain or ajwain powder. Mix well. Add jaggery or honey if required. Boil it for 5 minutes and switch off the flame. Cool it down and strain the water using a strainer. Serve warm but not too hot. Ajwain has antioxidants that can help in curing diarrhea in babies and children. Boil 1 teaspoon of ajwain with rock salt in one glass of water. Strain the water and give in doses of 1 or 2 drops to your child to cure diarrhea, dysentery, indigestion, colic and flatulence. Ajwain has antimicrobial properties which means that it can act and help even against some of the resistant and persistent bacteria that resist all kinds of antibiotics. When can Ajwain be given to babies? Ajwain seeds can be included in a baby’s diet from 8 months onwards. Initially, ajwain can be given as ajwain water but only 2-3 tsp per day at the maximum. An ajwain potli can be used from infancy. Once the baby begins eating all family food, you can gradually include ajwain in other food items like ajwain paratha, ajwain puri, etc. It is recommended to give ajwain water only 2-3 times a week for babies aged less than a year. For babies above one year, it is recommended to give 1/4th cup of ajwain water only 3-4 times a week.